First of all, I was really surprised that the nightstand came as quickly as it did. It was packed so well that there wasn’t any damage to nightstand, even though the box had a good size gash that went all the way through. The nightstand is very close in color to our bedroom set, which we bought 13 years ago. I’m very, very happy I bought this and yes, I would recommend this product and Overstock to anyone. Blending a classic, heirloom style with the needs of today's modern world, this beautiful mission nightstand is an extraordinary piece. 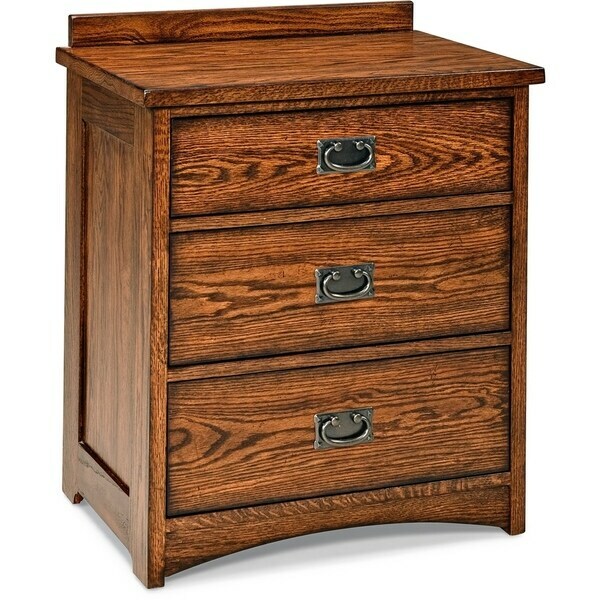 Adorned with rustic style accents for a mission look, this nightstand features beveled edges, deeply grooved drawer fronts, and Arts and Crafts style, dark metal hardware. The three-drawer nightstand is handy for storing clothes, accessories, or anything you need close at hand first thing in the morning, including your cell phone and devices. You can easily charge your electronic devices while you sleep with the handy, Four-outlet charging station built into the top drawer. The cedar drawer boxes are smoothed so they wont snag your clothes and exude the fresh scent of cedar wood. Dimensions 25.0 In. X 17.0 In. X 30.25 In. Beautiful!! Matches my other bedroom furniture. Great construction. I have the set but only had 1 night stand. Now I will have one for each side!